The Fatigue Solution was created by Dr. Eva Cwynar, M.D.an endocrinologist, metabolic medicine specialist, and internist practicing in Beverly Hills. This program will help women overcome fatigue by following eight simple steps. It centers on increasing physical strength, emotional balance, sexual vitality and energy restoration. Readers are introduced to an eight-step plan to enhance health, longevity and quality of life. These steps all work together to restore your energy. A two-week meal plan is provided, which emphasizes protein at every meal and snack. The inclusion of low glycemic carbohydrates and healthy fats helps to keep your hormones and energy balanced. All of the meals are easy to prepare, to preserve your energy, and low in calories, for weight loss. Eggs, shrimp, salmon, tuna, chicken, beef, whey protein powder, yogurt, goat cheese, whole-grain bread, oatmeal, hummus, almond butter, walnuts, kale, spinach, carrots, bell peppers, snap peas, lettuce, avocado, broccoli, apple, grapes, mango, coconut milk, olive oil, balsamic vinegar, low-fat mayo, stevia. This Fatigue Diet says that even if you are feeling tired, regular exercise will increase your energy. The most important thing is to get your body moving so choose an activity that you will enjoy. A combination of aerobic, resistance, flexibility and Tai Chi exercises are recommended. The Fatigue Solution: Increase Your Energy in Eight Easy Steps retails at $24.95. Click here to purchase this fatigue diet plan for a discounted price. Includes a wide variety of unprocessed foods. Encourages the consumption of low-glycemic carbohydrates and healthy fats. Provides unique advice regarding women’s hormones and sexual health. Does not include a structured exercise plan. Not a treatment plan for chronic fatigue syndrome. Active women will require a higher calorie intake. 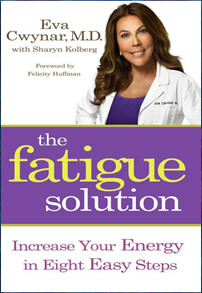 The Fatigue Solution provides readers with a variety of strategies to alleviate fatigue and related health complaints. This fatigue diet will particularly appeal to women with hormonal issues, who are experiencing chronic low energy levels.